Most women bowlers don't have this problem AFAIK, but I am unfortunately one of the few who do. I haven't met anyone who has this problem yet. I have a large...erm...bust. Not as large as celebs like Doly Parton, but up there. So large I cannot put my arms directly against my sides. I have always had this problem from youth. Well, I am in my 50s now and could stand to lose weight, especially in that area. But meanwhile, they interfere with my swing and being able to throw the ball straight. I am a straight shooter (no pun intended). 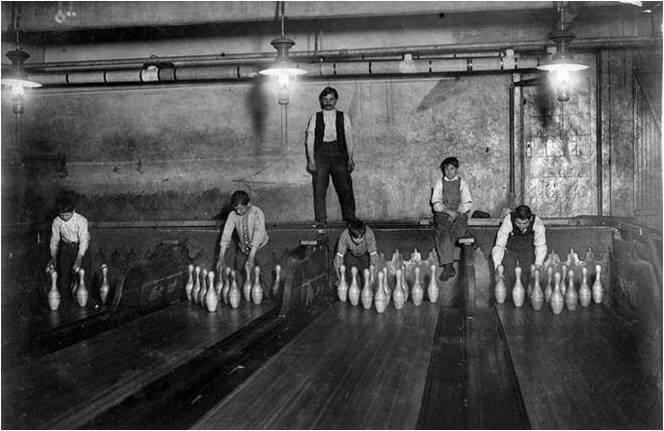 So, because they get in the way, I often throw my arm across my body, leading to the ball going to the right and sometimes straight into the gutter. I doubt that any man can appreciate your problem, but anyone who is overweight might experience some. Two areas to look at are body-tilt and body angle. On the internet, search for body-tilt and body-angle drills by Joe Slowinski. I think with just minor modification, you'll find a happy medium that will work. You'll probably loosen up your whole arm-swing too. First, what's wrong with being a straight shooter? Next, Joe Slowinski also has some articles on DYDS. He suggests for all bowlers to drop their shoulder (i.e., your ball side shoulder). What this does is give your arm some room to swing the ball straight and not have to wrap your ball around your body. It allows for your head to lean to the right for right-handed folks. Some have said that your ball side shoulder should be several inches lower than the other. One other thing you might try is starting your approach to the lane from more left than others use and walking up to the foul line at a slight angle to the right giving you even more room to swing the ball perhaps even across your body. I'm hoping that the idea of dropping your shoulder may be the ticket to success for you. It's only a problem because of the way you stand. I think you are too erect in presentation. So, move your upper body to the ball side, so that your arm has a free swing (pendulum). You can practice that just standing. Then, you have to walk in that position, with minimal sway. A forward lean would be helpful at the release as well. At all times, keep your head over the ball path. I had a student, mid-late 50's, who had a similar problem, with the exception that it was her hips that were too wide. There was no way she could even swing her arm straight at her side. Well, with the proper side lean and forward reach, she is enjoying bowling much more. But, it takes practice. I would refrain from turning your body to the side, as many profess. Anyway of posting a video so we can see what is causing the issue?